A medical school applicant’s average GPA is one of the most important factors in the medical school admissions process. In fact, the average GPA is one of the two most important metrics for medical school admissions officers. Your average GPA will be evaluated and interpreted based on several different factors. Admissions committees know that some colleges are more rigorous than others. For example, let’s say Applicant A attends a very prestigious college (Prestigious College) where it is very difficult to earn As. Now, let’s say applicant B has a 4.0 GPA but attends Easier College that is reputed to be less difficult. A medical school might consider a 3.4 GPA from Prestigious College more impressive than a 3.9 from Easier College that is less rigorous. Your GPA will be considered alongside your MCAT score since the MCAT score is the great equalizer and is the only way to objectively compare one applicant to another. Consider the two applicants described above. If Applicant A from Prestigious College and Applicant B from Easier College both earn a 517 on the MCAT, it is more likely that they will be considered comparable applicants from an academic standpoint. However, if Applicant A earns a 517 and Applicant B earns a 508, it further supports the notion that Easier College is indeed easier. The bottom line is that, no matter what the rigor of your college, your average GPA and MCAT will be looked at together and earning the highest MCAT possible is essential since this metric is the only objective measure admissions officers have access to. Medical school admissions committees will evaluate the academic rigor of your coursework. If you took very challenging classes and earned a high GPA, that would be more impressive than taking mostly easier courses and earning a high GPA. Medical schools not only like to see high average GPAs, but, they also seek students who embrace challenge and are intellectually curious. For all of these reasons, enrolling in as many challenging course as possible without compromising your overall GPA is ideal. Medical school admissions committees know that you are human! Many students do not do as well early in college for many reasons. Some students may need time to develop study and time management skills, others may be homesick, and some may be getting settled socially. Therefore, admissions committees look at grade trends with an upward trend being ideal. Medical school applicants often worry if they have a bad grade (or two) on the transcript. Not to worry. Medical school admissions committees understand that once in a while circumstance may lead to a bad grade. As long as poor grades don’t become a trend and one or two bad grades don’t have a huge impact on your GPA, this is typically something that can be overcome. What Is The Average GPA For Medical School Acceptance? 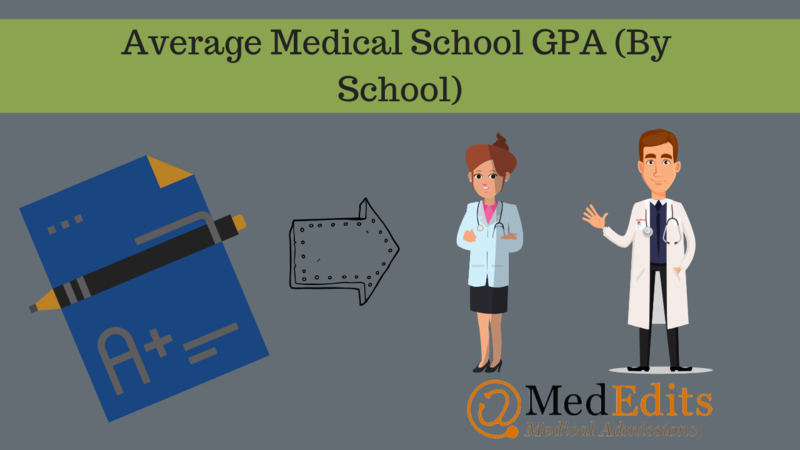 The average GPA for acceptance to allopathic medical school is 3.72. The average GPA for acceptance to osteopathic medical school is 3.54. At MedEdits, we recommend earning a GPA of 3.5 or higher to be competitive for allopathic and osteopathic medical schools, however, depending on other factors, you can be successful with a GPA lower than this. The GPA is broken into three categories in medical school admissions. BCPM GPA: The BCPM GPA is your “science GPA” and consists of all courses in biology, chemistry, physics and math. To find out what course fit in to this category specifically, you should check with your college registrar. AO GPA: The AO GPA are all non-science and math courses or courses that are not in the BCPM category. Total GPA: The total GPA are all of your course grades averaged together. So, which GPAs matter most to medical school admissions committees? The BCPM is the most important GPA to medical school admissions officers since a career in medicine requires mastery of and fluency in the sciences. After the BCPM GPA, your total GPA matters most. Often the total GPA is what is used to screen applicants during the initial phase of the medical school admissions process. Based on overall GPA, there are 10 most competitive medical schools. Interested in learning how to make yourself more competitive for medical school acceptance? Sign up for a free consultation now.